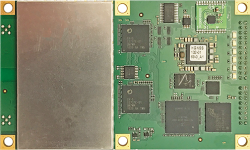 Hemisphere GPS has released an OEM development kit for its Eclipse dual-frequency GPS receiver technology. Development kits allow product designers and system integrators to more easily access and test all of the available features on an Eclipse board, simplifying the effort needed to reach a proof of concept and shortening the time required to bring a product to market. Announced last September, Eclipse delivers centimeter accuracy to the OEM integrator, according to Hemisphere GPS. Eclipse represents a further evolution in the company’s Crescent L1 GPS technology that incorporates proprietary techniques for reducing code measurement noise and mitigating multipath signals. Depending upon the application, Eclipse users can record and post-process GPS data or choose from several differential solutions including real-time kinematic, OmniSTAR (HP/XP), and satellite-based augmentation systems such as WAAS or EGNOS.